Odisha government has made an enhanced budgetary provision of Rs. 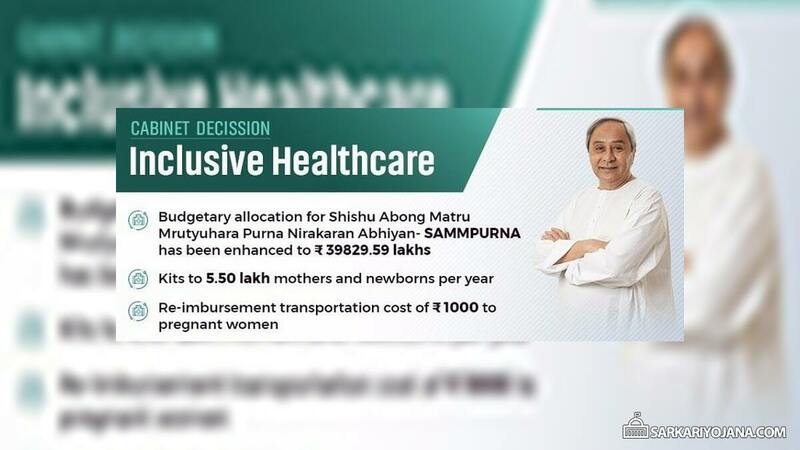 398.29 crore for Shishu Abond Matru Mrutyuhara Purna Nirakaran Abhiyan Scheme for pregnant women. Under this SAMMPURNA Yojana 2019, the state govt. will provide reimbursement of transportation cost of Rs. 1,000 to pregnant women. In this scheme, govt. will also provide kits to mothers, newborns and drop back facility after institutional delivery and sick infants after treatment in Primary Health Care (PHCs) Centers for inclusive health care. The primary objective of SAMMPURNA Yojana 2019 in Odisha is to reduce the Infant Mortality Rate (IMR) and Maternal Mortality Rate (MMR). The amount of Rs. 1000 will be given as transport cost for pregnant women to travel to the hospital from inaccessible areas arranging their own vehicles. Under this Sampurna Scheme 2019, around 7853 villages would be covered from 30 districts of Odisha. The state govt. will provide kits to 5.50 lakh mothers and newborns per year under Sampurna Scheme 2019. The state govt. will also provide Rs. 50 per day to mother of children admitted to NRCs. Rs. 500 would be given for drop back facility to pregnant women after institutional delivery and sick infants after treatment in PHCs. Bike ambulances are going to be operational for transportation of patients where ambulance can’t reach. Govt. will sub-lease allotted land for affordable health care projects in Public Private Partnership (PPP) mode. This lease is going to be given as per prevailing premium of IPR 2015. Lease period will be for 32 years and would be given in extended mode for 5 years. The revised estimated cost for free diagnostic, dialysis including free healthcare has been enhanced to Rs. 757.50 crore. This amount has been enhanced due to requirement of additional Rs. 71.91 crore to waive off OPD & IPD, OT, ICU charges.